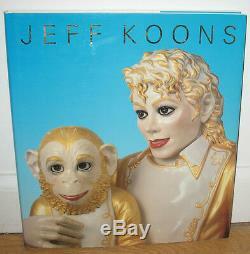 SIGNED by Jeff Koons on the title page and with a flower drawing. Very good in a very good dust jacket. 65 mainly color plates as well as one color frontispiece and 16 smaller photos. White simulated leather with gold lettering. Commentary by John Caldwell, Jim Lewis, Daniela Salvioni, Brian Wallis, and Eugenie Candau. Also includes director's foreword, plates, exhibition history and bibliography, exhibition checklist. White cloth boards with gold-embossed titles along spine and front cover. Boards clean and bright with very light wear. Minor shelf wear to the dust jacket. Semi-circular crease to the bottom edge DJ front cover. Few scratches and scuff marks visible in the light. Soil spots to bottom fore edge. Internally, tightly bound with very clean and crisp pages. Rare signed book and with a small drawing. 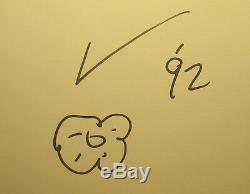 The item "SIGNED Drawing Jeff Koons San Francisco Museum of Modern Art 1992 HC DJ" is in sale since Saturday, March 2, 2013.